In keeping with NOSM’s mission to improve the supply of physicians in Northern Ontario, the School partnered with the North West Local Health Integration Network (LHIN), the North East LHIN and HealthForceOntario (HFO) Marketing and Recruitment Agency to host Summit North: Building a Flourishing Physician Workforce. The Summit was held on January 24, 2018 in Thunder Bay and had over 130 people who took part including representatives from Indigenous communities, Francophone communities, hospitals/health services, family health teams, the Ontario Ministry of Health and Long-Term Care, the Ontario Medical Association and local government. 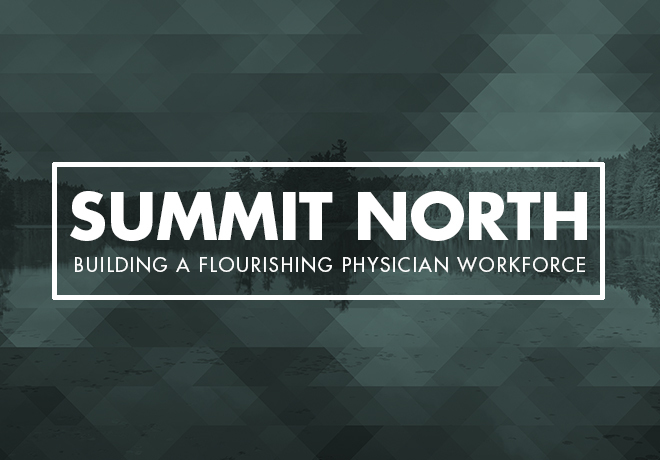 Drawing on experience in other jurisdictions and on intensive group discussions, Summit North developed short and long-term solutions to build a sustainable physician workforce. Subsequently, the Northern Physician Resource Task Force has developed an Action Plan based on Summit North’s solutions. Summit North’s title drew on the work of Dr. Denis Lennox who retired recently from Queensland Health in Australia. Over the past few weeks (May 21 – June 7), Dr. Lennox visited seven communities in Northern Ontario as the first stage in a projected Knowledge Transfer through which Northern Ontario will develop our own Service and Workforce Design team(s), similar to Queensland. Service and Workforce Design teams assist struggling communities in redesigning their service models to address population health needs and to recruit physicians, enhanced by active community participation. The model also includes a rural generalist pathway which, if implemented in Ontario, would feature a NOSM (PGY3) enhanced skills in rural generalism with a goal of creating a stable physician “pipeline”. NOSM is excited to be sponsoring this initiative and working with the Task Force to ensure high quality, reliable healthcare in remote rural Northern Ontario communities.